That is it. You are catching on. Write what you like, no problem. If the thread subject is senseless why not you too? just cos its pointless to you, doesnt mean it is so for everyone. I agree the thread should be shut down. Well said. 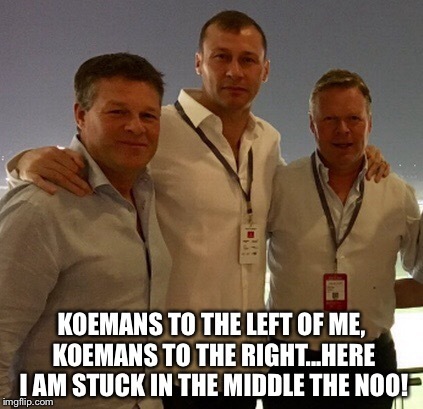 The other one on sacking Koeman or not is more entertaining. Last season he was full of seeing "the project through", I don't watch everything, but I haven't heard him say "The project" once this season. It must be true if it is on social media, Right? I also heard that Corbyn has taken over the country by force. St George's Hall is surrounded by young men with a red star on their caps. False alarm.....The young gentlemen you refer too are the Shenzhen Red Shite Supporters Group,who were flown in yesterday by pilot Li Tie for a banquet at the hall,hosted by those two worldly football colossus Aldridge and Fairclough.